What a busy week with lots of giveaway fun!! Thank you to everyone who left wonderful comments on the Cultural Fusion Quilts book and the SewMamaSew Giveaway Day posts. I loved reading your thoughts about the book and hearing about your favourite fruits. There were even fruits I'd never heard of like clementines, and honey crunch apples, I hope I get to try them one day. A big welcome to all those that signed up to follow my blog. I'd love to return the favour and visit your blog too, so leave me a comment so I know where to find you. I'll announce the winners in a moment but first I'll share the blocks I couldn't resist making as soon as I'd read Cultural Fusion Quilts. The quilt pattern is called Rocky Road to Kansas. The blocks were a great opportunity for lots of free cutting and piecing gentle curves. I had a great time playing with bright contrasting colours. And fabrics too, there's a bit of old pyjama pants in the mix, some older fabrics and some new ones. I really like the quirky diamonds created by the adjoining crosses. My trusty sidekick on the Rocky Road to Kansas adventure was Betty Bernina. It's not often I get her out from under the bed but when I do I love how true her stitches are and the steady purring noise of her motor. Pretty good for a $10.00 find at a garage sale. I've been thinking I should call my quilt Afternoon with Betty. I haven't decided whether I should add borders yet. I'll have a look through my stash to see if the right fabrics jump out at me. Okay, I'll stop keeping you in suspence and announce the winners of my recent giveaways. The Random.org thing did the choosing. I've emailed the winners and will be sending out packages when the post office opens on Monday. Thanks again to everyone who participated!! You can still have a chance to win a copy of Cultural Fusion Quilts by visiting the last few blogs on the book blog hop. Or race over to Amazon and pick up a copy there. I am really envious of your winners, Rachael! I would have loved to win the Cultural Fusion book, it looks amazing! Lucky girl! Your flimsy looks wonderful, but me being me, it would worry me to death that none of the seams match! LOL I do realise that this is the pattern, but nevertheless, I would never manage to make it and remain sane. Congratulations toothed winces and hank you Rachael! AnAfternoon with Betty sounds like a perfect name for your beautiful quilt! Ahhh, just wonderful. You make it seem so effortless. Wow Rachel - that is beautiful!! I want to make one! I've not really tried curved piecing before - does the book guide you through it? I'm going to order myself a copy for Christmas - I might do that right now actually! I love Bernina Betty. I can't believe she was only $10 - what a great find! You are the queen of using bright colors together! You make it look so easy! Beautiful. love "afternoon with betty" - you are so amazing at pairing fabrics ! Hi Joaefina, thank you for saying you love my creativity. I'm just told what to do by the pattern and the fabrics jump out of my cupboards, I just help them along. Rachael, This quilt is gorgeous!!! I wish it could have been in the book! Oh how I love your color combos and those mismatched points. Thanks for experimenting with the blocks. They are like a song from the musical- "Afternoon with Betty"! Thank you for giving away an extra copy of the book to your readers. You have gone above and beyond as a friend. I am thankful for that. Congratulations to all the winners and thanks to all the participants in the tour. It was fun reading everyone's comments and feel loved from the distance. Sigh - I desperately wanted this book so I ordered a copy! so I can't wait to receive it and dive in! Your quilt looks fabulous! LOVE the name Afternoon With Betty -- what a WONDERFUL quilt top!! Oh, Rachel, your blocks are just stunning! I think we'll be seeing lots of Sujata-inspired quilts in 2015. BTW, comments will be open on my blog until Tuesday evening if people are looking for more opportunities to win a copy of the book. Love your new flimsy, Mrs. RD! Very fun blocks! I really like your choices of fabrics. I am going to have to pick up that book for my very own. This is my sort of block! Nothing matches :-) But at the same time your "Afternoon with Betty" is so very you. Congratulations to the winners. Love your quilt Rachael and I think Afternoon with Betty is a great name for it. Have ordered the book and can't wait for it to arrive. Love your version of the Rocky Road to Kansas! So many fun fabrics and unexpected combinations. I especially like your mix of old and new in this piece. All bright and fun. It reminds me of the unique mixtures in your flower arrangements. Bravo! I really enjoy looking at your combos of fabrics. You have a real knack for combining the most interesting patterns. Ps.....was comment number 4 a typo?? Lol! Congratulations to all winners!! We are winners too watching what Rachael can 'whip' up with Betty on the way to Kansas :) cheers. 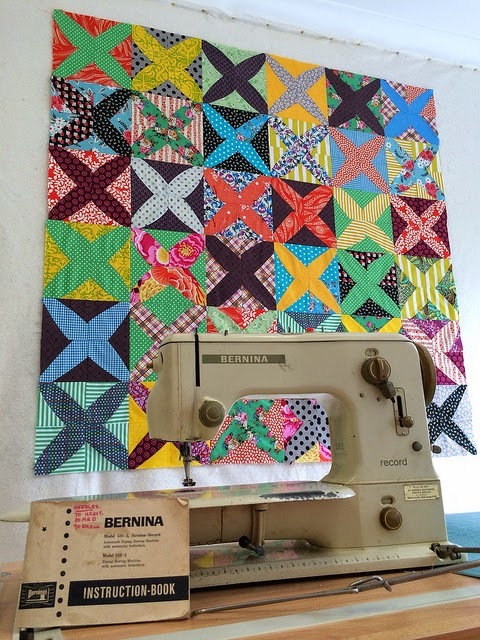 What a fun whimsy - and I absolutely love the name "An Afternoon with Betty"
Love that quilt, the bright colours are fantastic, you are one of my kind who love the bright happy colours. The book is on my wish list. I love all the dots and stripes in this! And it's always great fun to see a vintage Bernina too!! If you want to know what it's like up here in Alaska, you can check out my blog at ouralaskalife.blogspot.com. Congratulations to the winners! You've made another favourite of mine. I love the mix of fabrics and the name. What a treasure Betty is, you can't beat those heavy old basic machines for a great stitch. Love Afternoon with Betty those colour combos are fabulous. I'm off to order a copy of the book! Very cool quilt. Love all the prints! Love these blocks. Just 'you'. Great sharp colour contrasts and yet it all gells beautifully. 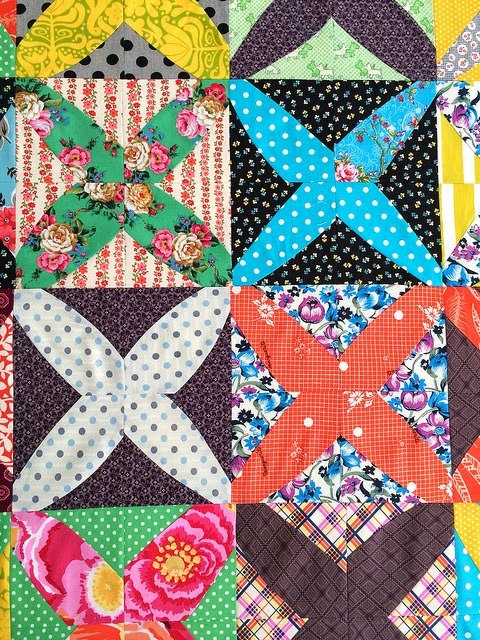 LOVE your quilt, sweet Rachael! Wow Rachael, I'm so glad that I found your blog through Sujata's book tour. Your quilt has me ready to start on one of my own! There's so much great inspiration in your old posts, too. Beautiful work!! I do love the look of your "afternoon with Betty" - and it's the perfect name! Alright after seeing this quilt you made I need a copy of this book! I'll order it with my next amazon installment:). Don't you think it would look great made up in that new Jen Kingwell line coming out! You have such an eye for putting fabric together but I need the help of a professional. You have been having fun with these blocks. There are so many gorgeous fabrics, too. These old Berninas are amazing. I don't think they ever stop! Congrats to your winners and well done on your great give away! Afternoon with Betty is wonderful! I love your road to kansas. 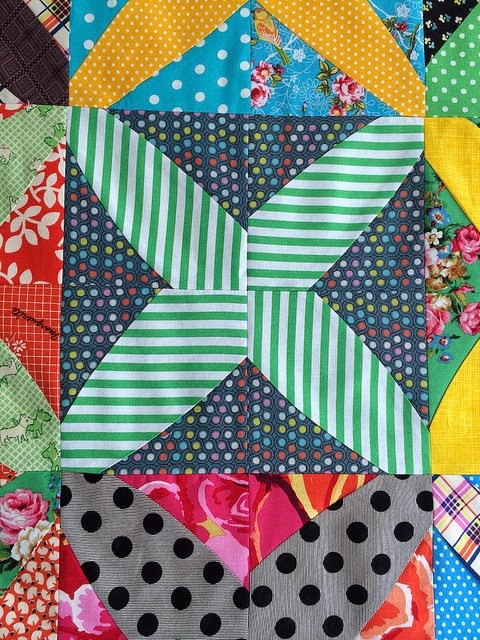 I've been thinking about which quilt I want to try from Sujatas book, maybe this one, it looks so fun! p.s. love your Betty machine. Can't wait to see the new sewing space. Love this quilt - you now have another follower!! I just love it. The colours are so cheerful, with a great retro vibe. You should be very pleased with it. I'll be interested to see if you add a border or not. I think it looks fine without. You have such wonderful, whimsical fabrics. This might be a silly question, but, are you're fabrics Australian, and are there fabrics manufactured in Australia ? I could probably Google that, but I would rather hear what information you have. AFternoon with Betty -- what a great name. 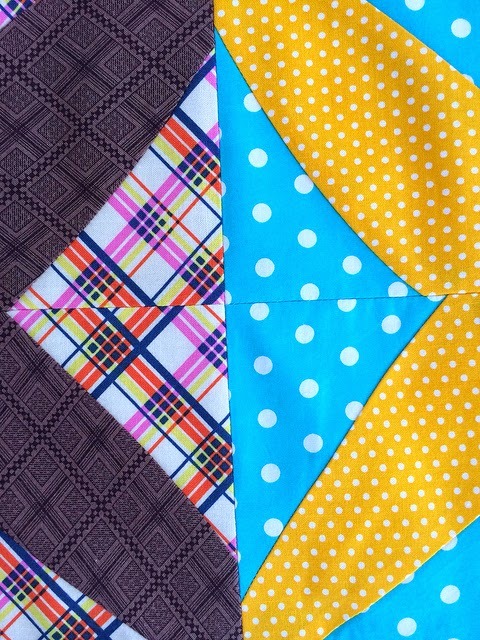 I Love that little quilt top -- so colorful! I just adore your quilt!!! Fantastic. Those fabrics all look so perfect together.How easy was it to sew those curves? Sewing curves on the machine make me break out in a cold sweat. Thank you for my gorgeous Tula Pink fabric pack - such divine fabrics... think I might have to buy Cultural Fusion Quilts and use them for something from there.... feel very very VERY lucky!! 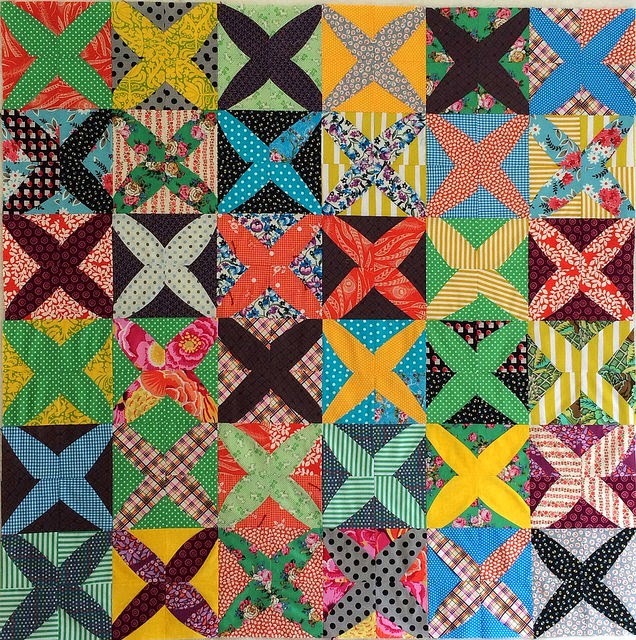 Love your quilt - such a beautiful use of colour. Love Betty too.